LinkedIn data from 2014 reported that women account for 39% of the sales workforce. By 2017, the U.S. Bureau of Labor Statistics reported that women make up 48.4% of retail salespersons. As the diversity of the workforce continues to grow, so do the concerns of women in the workplace. The reality is that companies that do not take this diversity into account will come under intense pressure, and ultimately get left behind in the wake of more progressive competition, and the sales industry is not exempt. It is arguable that the inequalities present in sales are the result of broader, systemic issues. However, this doesn’t excuse the necessity for these issues to be adequately addressed on individual and company levels. Ultimately, cultivating more equality in the sales training and coaching processes is one step in the greater marathon of addressing workplace inequalities, which demonstrates value to your employees as well as your consumers. It’s easy to despair in the face of injustice, and simply continue business as usual. But business as usual is not enough for progress and success in an increasingly diverse context. In order to better address inequality in our sales coaching strategies, we must first recognize the problem in its fullness. Since sales is a traditionally male-dominated industry, many are simply unaware of the adversity women face in a sales environment. Others neglect to address it because, frankly, it's uncomfortable. In any case, the gender inequality that dominates our business practices still demands attention. Many companies address the issue by implementing more diverse hiring practices, but that is only the beginning. Even now, the percentage of women in leadership declines as you go up the sales ladder, and consequently only 5% of Fortune 500 Companies are led by women. This is not for lack of skill. As Microsoft Chief of Staff Rakhi Voria points out, statistics show “women have characteristics and skills that make them natural fits for sales,” including empathy and active listening. Research from the University of Illinois at Chicago found that in general, companies with higher gender diversity have a 42% higher return on sales. So though the principle of diversity should be sufficient to demonstrate its necessity, know that it can be good for your bottom line, too. Cynthia Barnes founded the National Association of Women in Sales Professions to respond to disparities in sales training and practice that became apparent throughout her ongoing career as an award-winning salesperson and coach. Her work is evidence that gender inequality in sales does not stop at hiring, but is also apparent in sales training and coaching practices. In fact, one recent survey indicated that 64% of men said they received access to training resources, followed by only 48% of women. There’s no question that the statistics should be 100% for all parties involved. However, as Barnes explains, sales training and coaching processes “were mostly created by men, for men, during a time where men were the majority of the sales force.” While women make great salespeople, that doesn’t make them any less deserving of great training and coaching resources. Barnes provides a wealth of advice on how to make sure you’re giving the women on your team the same level of development opportunities as their male coworkers. How are women compensated in comparison with men in the same role? How are women promoted in comparison with men with similar experience and tenure? How do men and women perceive access to training and coaching support? Notice that these questions are not only concerned with the data of your team dynamics but also your team’s perception of support. A lot of managers think that they’re coaching well when often their team doesn’t even perceive them as coaching. Who does the sales coaching? Is it a balance of men and women, or are your sales coaches primarily men? Barnes reminds us that women respond better to women coaches, and you’re also avoiding the risks inherent in putting a man in a position of power over a woman. She recently conducted a survey that indicated men are “increasingly worried about coaching women in one-on-one situations” as the epidemic of workplace harassment has come to light. Make sure that your male coaches are trained well with an understanding of respect for diversity in the workplace. And if you find that you don’t have any female sales coaches, it may be time to go back to that audit and consider your promotion practices. Barnes even suggests inviting outside coaching while investing in some gender based training. Additionally, integrate clear anti-harassment policies into your training practices while also giving women fair representation in your sales leadership. Barnes laments that traditional sales training tends to downplay valuable strengths that women often bring to the table, especially if training is focused on one particular approach to sales. 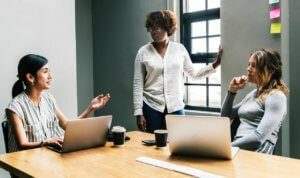 Women often provide a fresh perspective and approachability to the sales process, and this is taken for granted “when businesses train every employee to act like a traditional ‘alpha-male’ salesperson.” Sales can have a negative connotation of pushiness, often using masculine language and competition to make a point or strike a deal. Barnes explains that most people prefer a “quieter, less intrusive” approach from a salesperson, which women may naturally provide. Inequality and injustice in our world can be intimidating, especially when drawing attention to it means changing traditional practices. But by evaluating and transforming the ways that you coach salesmen and women alike, you can have a hand in creating better salespeople overall and a safer, more productive work environment.